Monday Motivation | What ONE Power Word Reflects Your Vision for 2018? It’s the first day….better yet, the first Monday of the new year and I couldn’t think of a better time to urge you to choose a power word to reflect your goal of self-improvement for the new year. Around this time, people reflect on the past year and envision the promise for greatness to come. The most successful people write down their goals, thoughts, and ideas to manifest the power of the law of attraction. Oprah explains, “Create the highest, grandest vision possible for your life because you become what you believe”. Back in 2013, I asked readers of She Makes Cents to share one word to reflect their personal goals/resolutions/vision for the year ahead and the response I got was inspiring. Since this, I have asked the same questions to readers every year on the first day of the New Year. With every 365 days that go by, we evolve and our needs, wants, and aspirations change. That being said, it is important to create a foundational vision with a “power word” to help guide the path ahead. Looking back at my earlier words, I remember where I was in my life, what was important, and what I needed to work on. In 2013 my word was balance. Then came focus (2014), passion (2015), bravery (2016), and intention (2017). For 2018, I chose “Declutter” as my power word. By definition, the act of decluttering requires one to simplify or get rid of mess, disorder, and complications. It also requires you to organize and prioritize your commitments and material possessions. The word “declutter” is one that I will apply to every area of my life in a mental, physical, and spiritual sense. I will take this year as an opportunity to declutter my finances, organize my career goals and execute those ideas, and rid my space of disorder. Back in 2011, researchers from the Princeton University Neuroscience Institute studied what happens how the brain processes clutter. When your environment is cluttered, the chaos restricts your ability to focus. The clutter also limits your brain’s ability to process information. Clutter makes you distracted and unable to process information as well as you do in an uncluttered, organized, and serene environment. I have never been so excited to apply a power word to my year and this one is all-encompassing to severals areas of my life. I know many people do not do resolutions anymore, but I still do. Now that I have my word of the year, I can create resolutions where I can clarify my goals and visions while ridding and mess and disorder that may negatively impact my money, career, or lifestyle. How do you define success? That is one of those open-ended questions that many people are asked in an interview. To be honest, we should be thinking about it outside of the normal boundaries of interview prep. Again, I ask, how do YOU define success? I am starting to believe that knowing the answer to that will help make decisions about money, career, and lifestyle clearer. Warren Buffet measures success by whether the people close to you are happy and love you. Deepak Chopra says, “Success in life could be defined as the continued expansion of happiness and the progressive realization of worthy goals”. For President Obama, “success isn’t about how much money you make. It’s about the difference you make in people’s lives”. I believe success is being happy with the life you create, which ultimately is a culmination of daily choices. The thing is, identifying what success means to you should help guide the path to reaching success, accomplishing your goals, and living the life you always wanted. To dominate your goals, you must first write them down and second choose a date to strive for. One of my very first money goals was to be debt free. I later realized that being debt free is not a goal, but being debt free by age 35 is. Do you see the difference? It goes back to the whole “day one or one-day” paradigm. To be successful at this aspiration, I have to make sure that my daily actions reflect my purpose. I will be honest, it is hard and sometimes I get off track, especially when the goal date seems so far away. My trick to conquering the hard times is to break my larger goal into micro goals. I take that larger target and break it into small manageable bites that are easier to digest. You can do this with money goals, career goals, relationship goals, and lifestyle goals. We have all heard that it take 21 days to make or break a habit. Recent studies have found that it actually takes about 66 days to cultivate a new habit. The key to staying motivated is understanding how long it takes to become prosperous in a new habit. It is important to be intentional with your everyday thoughts and actions. That is because success is found in your daily routine. Inspire | One Day or Day One? The difference between one day and day one is HUGE! One day I will buy my first house. One day I will apply for a job at my dream company. One day I will lose the weight. One day I will take that trip I have always dreamed of. You see, the notion of “one day” allows your dreams and goals for yourself to stay in a constant state of delays and may never happens. Sure, one day you may accomplish them but who knows when one day will come. By comparison, “day one” creates a start date of action to get you working toward your goals. Want to buy your first home? Your day one should include checking your credit report and score. Want to work for another company? Cleaning up your LinkedIn page should then become your first micro-goal. Want to lose the weight? Start by researching which foods are best for your goals and what foods to cut from your diet. Want to go on a trip, start putting money aside every check. Day one doesn’t have to be dramatic, but it is a necessary step in getting where you want to be. Once you get day one out-of-the-way, keep chipping at each of your goals until you accomplish your purpose. Doing so will make sure that it will be the last time you have to think about one day because once you start, you should be able to set a date of accomplish goal. I could say, “one day my student loans will be under the $15,000.00 mark, but instead I know that by my birthday in August, my student loans will break the $15,000.00 mark! See the difference? Want To Increase Your Happiness, Start Each Day With This…. By definition, gratitude is the quality or feeling of being grateful. It is a characteristic that some people naturally possess and that others can cultivate to greatly influence one’s overall happiness and well-being. According to Psychology Today, “studies show that we can deliberately cultivate gratitude and can increase our well-being and happiness by doing so. In addition, gratefulness—and especially the expression of it to others—is associated with increased energy, optimism, and empathy”. In the spirit of deliberately cultivating gratitude, I plan to start the week with a gratitude list and I invite you to join me. 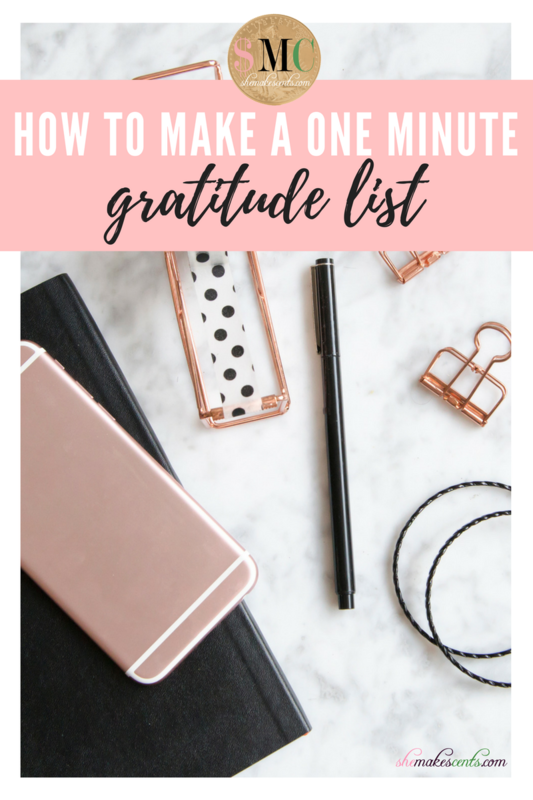 That’s right, grab a piece of paper and pen and take the next minute to make a list of the all the things in the past 24 hours that you are grateful for. Seriously, don’t spend more than one minute doing this and don’t over think or judge yourself for something that you think is silly. This exercise is simply to retrain your brain to recognize the daily blessings and the positive things and moments in your life. Writer and motivational speaker, William Arthur Ward, once said, “Gratitude can transform common days into thanksgivings, turn routine jobs into joy, and change ordinary opportunities into blessings.” Let’s kick off this week with intention and gratitude and see how our overall happiness and well-being is positively affected.